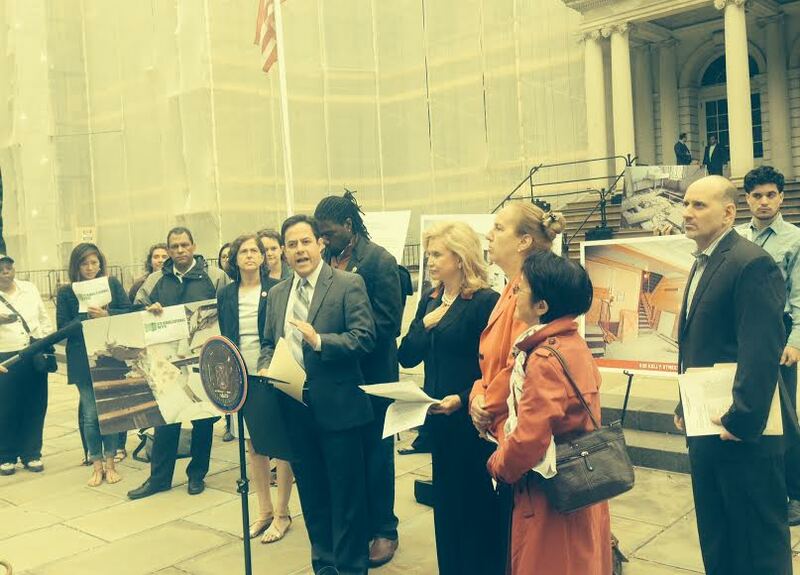 On Wednesday, Council Members Dan Garodnick, Jumaane Williams and Ritchie Torres announced the formation of a coalition of over 40 elected officials who are committed to keeping affordable housing from turning into overleveraged housing. Specifically, the Coalition Against Predatory Equity (CAPE) was organized in an effort to avoid the type of massive debt deals that have led to the loss of affordable housing like at Stuyvesant Town. To get Fannie Mae and Freddie Mac to commit to not lending to any owner in a deal that puts affordable housing at risk. Avoid investment of city and state pension funds in deals that harm tenants. Stop offering tax abatements or subsidies to development deals that would lead to the loss of affordable units. Garodnick, who released a report about the dangers of predatory equity in April, said the coalition is also concerned about the Stuyvesant Town foreclosure and the reports of a bid by CWCapital’s parent company Fortress. “We are looking into the appropriateness of all that activity,” said Garodnick, adding that all of the coalition’s four principles are relevant to a post-predatory equity Stuyvesant Town. Congresswoman Carolyn Maloney, who’s previously authored legislation that if passed, would ensure more responsible lending by Fannie and Freddie, said she’d reintroduce that bill this week. Along with politicians, over a dozen organizations, including the ST-PCV Tenants Association, Tenants and Neighbors and the Urban Justice Center, have joined the coalition. LOL. How do these politicians keep a straight face when they lie out their asses like this? Dan Garodnick has gotten the TA in bed with one of the worst predatory equity firms ever and then he gets up and talks this garbage. Its pure show, remember his buddies (and I’m sure Dan himself) stand to make a fortune if HIS predatory equity arrangement for PCVST goes through. All the others standing there congratulated and supported him when he announced the partnership. How stupid do they think we are? Pretty stupid I guess since we keep re-electing the same trash. It’s like looking at Putin standing there railing in favor of democracy and self-determination. Gimme a break! Great photo-op for hypocrite Goradnick.